The following is an overview of most of the Northern Cape museums in South Africa by location, including descriptions, contact details and website addresses, where available. The vast Northern Cape Province is the largest province in South Africa but has the smallest population. Visitors quickly come under the calming influence of the vast open landscapes, the early-morning sunrise over rust-red dunes and the roaming herds of antelope. The Colesberg-Kemper Museum housed in the old Colesberg bank, features displays on archaeology, local history and a large Anglo-Boer War memorabilia collection. The Mary Moffat Museum can be found in a building which had been a church since 1828 (and was used as a bank between 1903 and 1956). It features displays on the Griquas, San and other African groups since early 1800 and on missionaries from the London Missionary Society. The Duggan Cronin Gallery, a satellite of the McGregor Museum, Kimberley, exhibits ethnographic displays and turn-of-the-century photographs taken by Duggan-Cronin. The Kimberley Mine Museum, situated at the world renowned Big Hole is an essential part of any visit to Kimberley. Here visitors can view the biggest hole ever made with picks and shovels. The open-air museum comprises buildings dating back to the era of the diamond diggings. The Kimberley Tram Service, which dates from the beginning of the century, still transports passengers from the City Hall to the Mine Museum. At the Magersfontein Battlefield Museum, a satellite of the McGregor Museum, the old Boer trenches can still be seen from the hilltop. The museum has displays on the battle. The Pioneers of Aviation Museum stands at the site where the story of aviation in South Africa began and where the first flying school was based. It includes aviation displays and a replica of a Patterson Biplane. Visitors to the massive Wonderwerk Cave can see displays on the discoveries (cultural and faunal successions spanning the past 800 millennia) made at this important archaeological site. 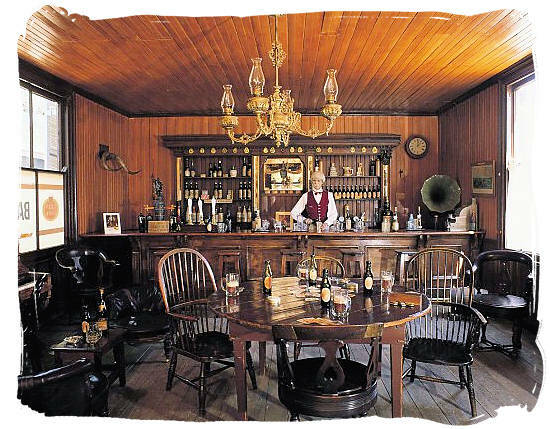 The Moffat Museum commemorates Robert Moffat, founder of the mission at the site in the 1820s. It is housed in several old buildings and a church and features, among its exhibits, the oldest press in the country, which printed the first Bible in Africa and is still in use. The Loeriesfontein Museum is an agricultural museum which boasts the largest collection of wind pumps in South Africa. The Prieska Museum tells the story of Prieska and its people and displays an interesting collection of household articles and early farm implements. The Kalahari-Oranje Museum, in a lovely site on the Orange River and home of the famous Donkey monument, built in 1875, has a collection of domestic items as well as articles relating to the history of Upington and the Lower Orange River. The Van Zylsrus Museum housed in the old church offers insights into the lives of communities struggling with the harsh climate of the Kalahari. The Victoria West Museum carries displays on the Prehistory of the Karoo and the cultural history of Victoria West. The highlight is a collection of fish fossils dating back 250 million years.